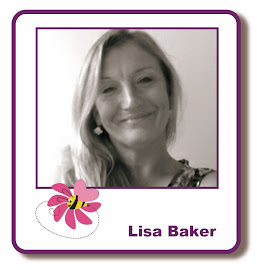 Hi everyone, Lisa here, hoping you're all enjoying the weekend. 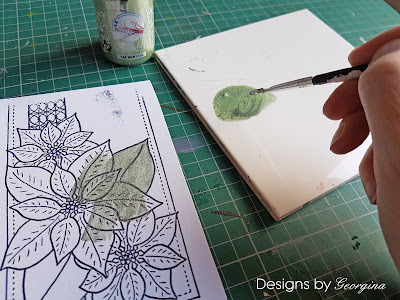 I'm delighted to bring you a guest blog post from Georgina Ford of Designs by Georgina. Georgina was on my DT in the past & we're all very happy to have her back for a little while. I'm sure you're going to love her projects. Georgina, it's over to you.............! 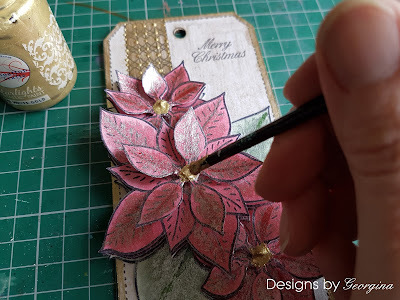 I have a sparkly festive tag to share with you today using my Designs by Georgina Poinsettia Tag which is available from Lisa B Designs. This would make a lovely gift tag for a special gift or a bottle of wine. Or you could just use it for home decor over the Festive period. 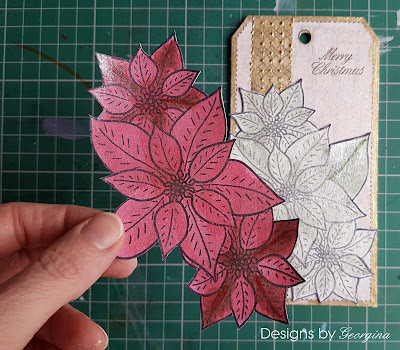 To make the tag I started by stamping my Poinsettia Tag stamp onto a That's Crafty White Greyboard tag with a Jet Black Archival ink pad. The sizes are very similar so I only needed to trim off the bottom edge slightly of the Greyboard tag so the blank edge didn't show. 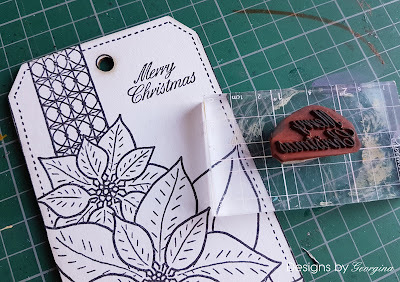 I then stamped the sentiment onto the tag again using the Archival ink pad. 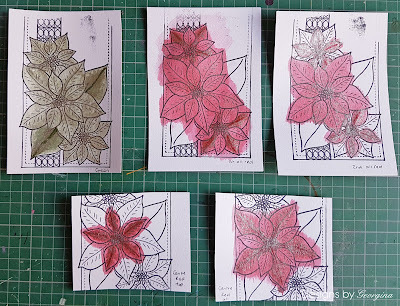 The sentiment is included in the Poinsettia Tag stamp set. 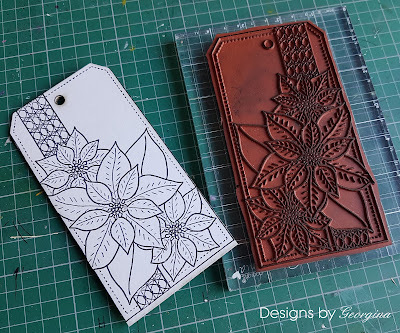 I then stamped out the tag design six times onto white card with the Archival ink pad. I again painted with watered-down Starlights. I used Green and Red for the Poinsettia leaves and flowers. 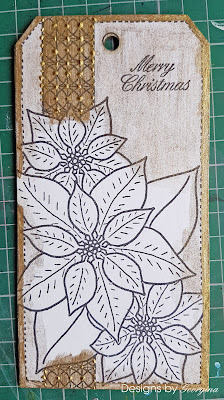 As I am going to cut out and layer-up the flowers I only need to paint some areas of the stamped images, as shown below. I then cut out the layers and attached them to the tag. I added the base green later first directly onto the tag. The other layers were added with foam pads for extra dimension. For the top flowers I only used a foam pad in the centre so the petals could be bent up. In the centre of the flower I added a large blog of White Gold Starlights. I left it to dry a little, for no more than five minutes. I then poked the White Gold Starlights with an end of a paint brush. This added little bumps onto the Starlight and I thought make it look for more a centre of a flower. To finish the tag I thread dark green ribbon through the hole and then tied a bow round the ribbon again using the same dark green ribbon. Thank you Georgina, this is gorgeous! 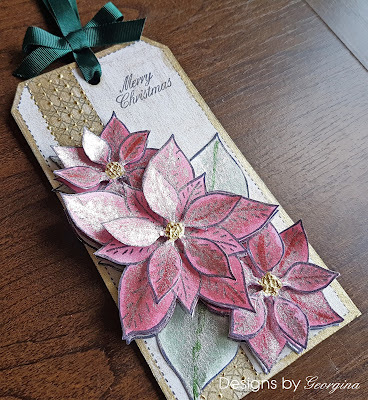 I love the layered poinsettias & the tiny dots of Starlights on the background were a great idea. 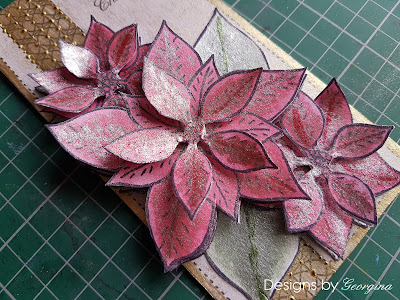 Gorgeous stamp, gorgeous tag! I love the 3D construction of the poinsettia.